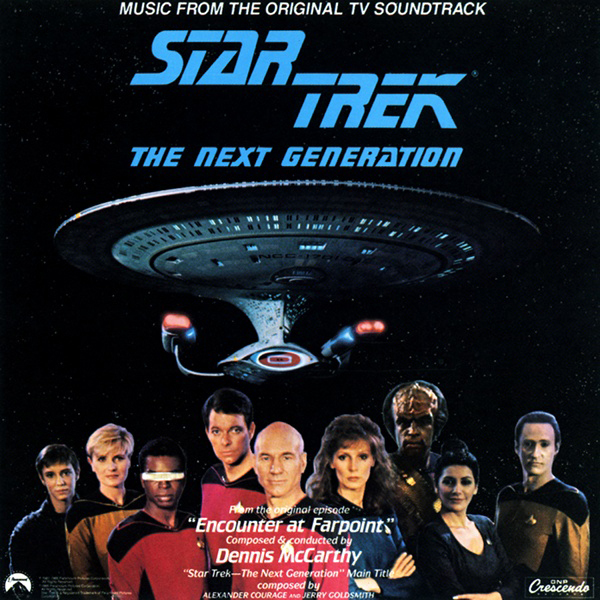 This is the first of 4 reviews for Becky of Film Music Central‘s Music of Star Trek Blogathon. For this blogathon, I decided to watch and review the pilot episodes of the 4 Star Trek spinoff TV show’s. Tnx to Becky for running this blogathon! Brief Synopsis – On the way to it’s first mission, the new Starship Enterprise- D and its crew encounter a strange and seemingly omniscient being named Q. My Take on it – As a kid growing up in the 80’s I really enjoyed watching the movies of Star Trek and the episodes of the Original Series. When I was about 13, we all heard rumors that they were gonna be staring a new series with whole cast of characters and my friends and I were quite excited. My science teacher also was extremely happy and being the nerd that he was, he always talked about being a Trekkie and we even had some nice conversations about the shows and movies over the years. I used to watch every episode as it came out and was hooked on the show. Of the 4 spinoff series, this was the only one where I have seen all of the episodes instead of just sporadic ones over the years. They do an excellent job of introducing the 9 main characters to the show here and we are able to get quite a good idea who everyone is just by the way they act and react during this feature length episode. The fact that they are able to have two concurrent storylines happen at the same time and still manage to introduce all of the characters is proof of how well it was written. Of the two subplots, obviously the one with Q is much more interesting than the Farpoint one but that’s mainly because Q is such a great and complex character who over the course of this series was utilized numerous times. I liked the way that they found a way to make a “slight” connection to The Original Series by giving us a cameo of McCoy having a short but memorable conversation with Data. The connection was big enough to be noticed, yet small enough to not take away from the idea that the baton has been handed over to a new generation. I have always loved the music from this series and the introduction has the best musical piece of any of the series’ that use just the music without a song [I’ll discuss that on Sunday when I get to THAT pilot. 🙂 ] and is the most memorable IMHO. Rewatching the pilot rekindled in me a spark that I hope stays lit for a while and I began rewatching the entire series since watching this episode. I have so far seen half of the first season and am debating whether to watch all 7 seasons and the move on the DS9, Voyager and the Enterprise or to watch the first season of each and then move on to season 2 of each and so on. Any thoughts or ideas from you guys would be most appreciated! Bottom Line – Great introduction to the characters of the best spinoff series (so far). They are able to develop each of the 9 characters so well within just 90 minutes while still having time to give us two good subplots dealing with Q and with the outpost Farpoint. Liked the way they made a “slight” connection to the original series while still staying focused on the new characters and ship. The theme song is my favorite musical piece of all 5 shows and is so memorable. Recommended! Tnx 4 the inspiration! Really enjoyed rewatching this after so many years. Btw, do u wanna weigh in on my query? you mean the email you sent about films in september? Sorry I have to pass, I got a lot going on right now. Np. Thats what I was thinking but after watching the other pilots I didnt want to have to wait so long to get to those shows. But chronological makes more sense. Better to go with my brain than heart. Tnx for ur input! Next Generation is an awesome series, for sure, and the music is one of its highlights! Personally I find “Farpoint” pretty clunky as episodes go. The Q plot is brilliant but the thing with the Bendi is pretty lame and sort of bolted on. It’s amazing the show managed to mature and become as good as it eventually became, given the first season episodes that were mostly terrible (“Haven,” anyone?) But the fun thing about watching them again is you can see all the echoes in the early episodes of how the characters and themes of the show would eventually develop and mature. You know I love Next Gen. I agree with Sean that the first episode (and season for that matter) aren’t as strong as the rest of the series, but every show has to start somewhere. I’d say watch each series as a whole rather than breaking them up by season. I feel like it would be easier to keep track of everything going on if you see each show as a whole.